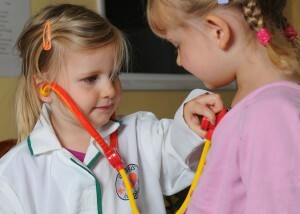 Woodpecker nursery is very proud of its high level of qualified staff. Whilst the national standards require half of all care staff to be qualified to a level 2 standard, we exceed those levels across the board. All staff are qualified to a level 3 standard as a minimum, aside from our 2 apprentices who are working their way towards their level 3 qualification with the training and assistance provided by the team. We actively encourage and support staff with further training – offering direct financial reward to our staff for enhancing their level of qualification, whatever their current role. We aim for all staff to hold a Paediatric First Aid certificate, which is regularly updated, along with training in Child Protection, Health & Safety, Food Hygiene and Manual Handling. We hold ‘in-house’ training sessions led by senior staff or outside trainers, and staff regularly attend training courses outside the nursery to enhance their professional development.